The person in the photo above is Lisa. She and her friend Preston drove all the way from Houston just to see me. 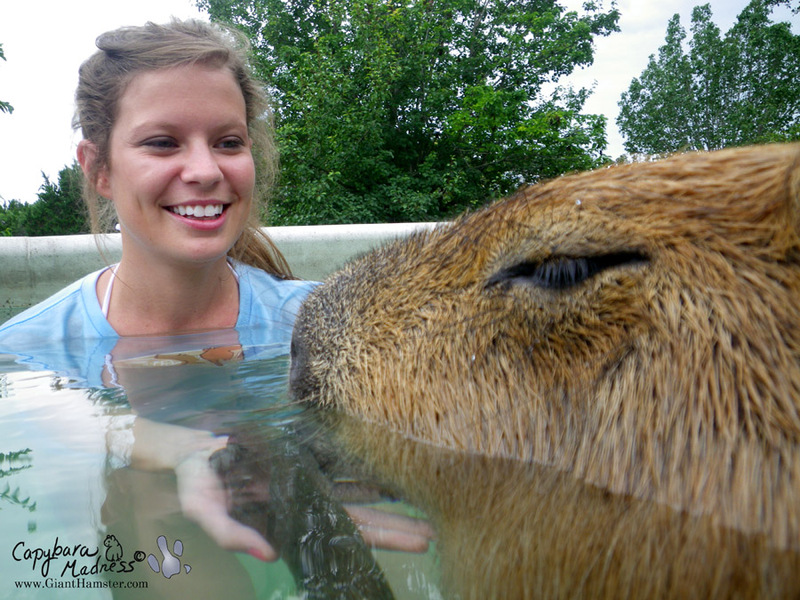 Meeting and greeting stalkers is one of my prime Capybara Ambassador duties. Stalkers are always very nice people and Lisa and Preston were no exception. What? I have to press that darned button to get a treat even from stalkers? How does that make sense? But these were really high quality treats, Frosted Mini Wheats. I don’t get those very often. As you can see, I forgot all about my lettuce once Frosted Mini Wheats entered the equation. I think I’m just going to show a whole lot of photos of my visit with Lisa and Preston and not bother with the commentary. The photos speak pretty well for themselves. 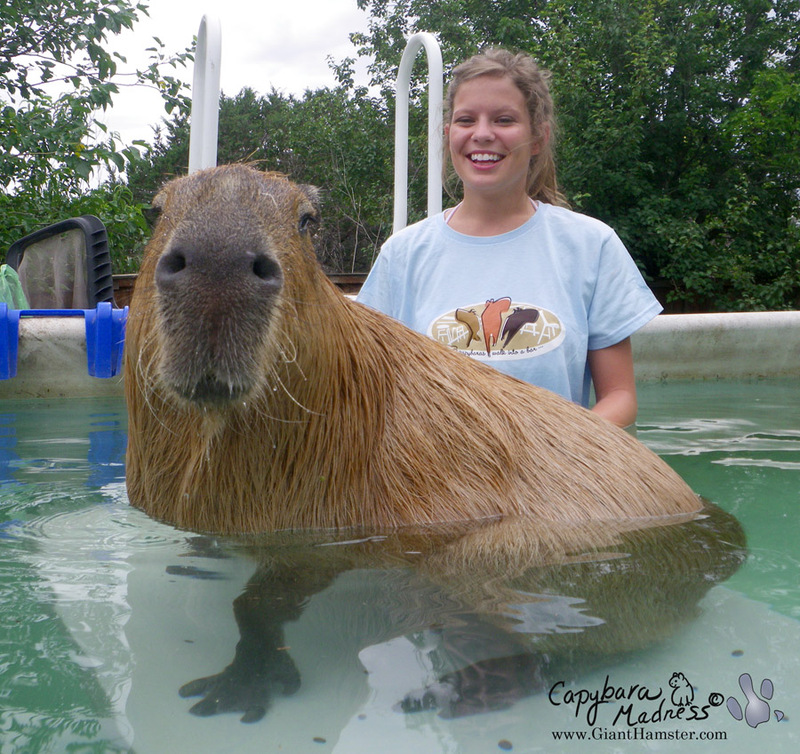 The only thing I’d like to note at this point is that Lisa is wearing one of our “Three Capybaras Walk into a Bar” tshirts! As if we weren’t having enough fun, guess what happened next! Coral came over with Flopsy the Killer Cat! 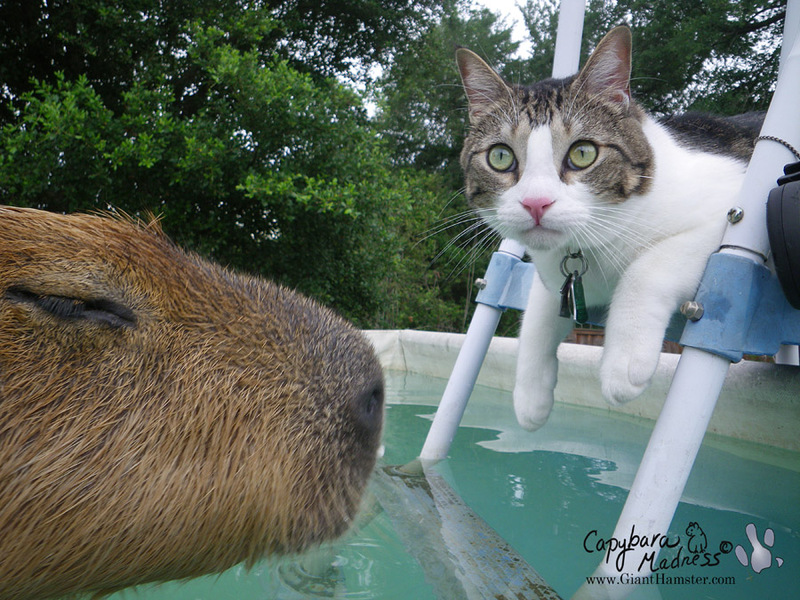 Why won’t he come in the water with me! It was nice and warm, perfect swimming weather. Will you come in if I ask from this direction? 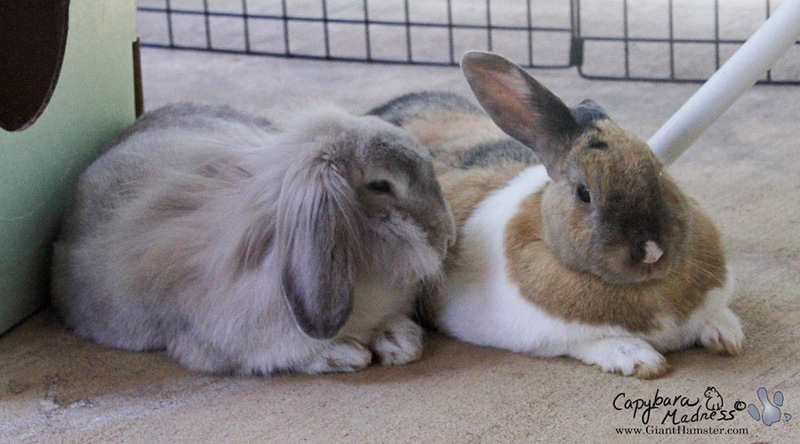 Coral, can Flopsy please come in and play? Coral says it's okay! Please come in! A tip of the tail to you, sir! Flopsy would never come in. 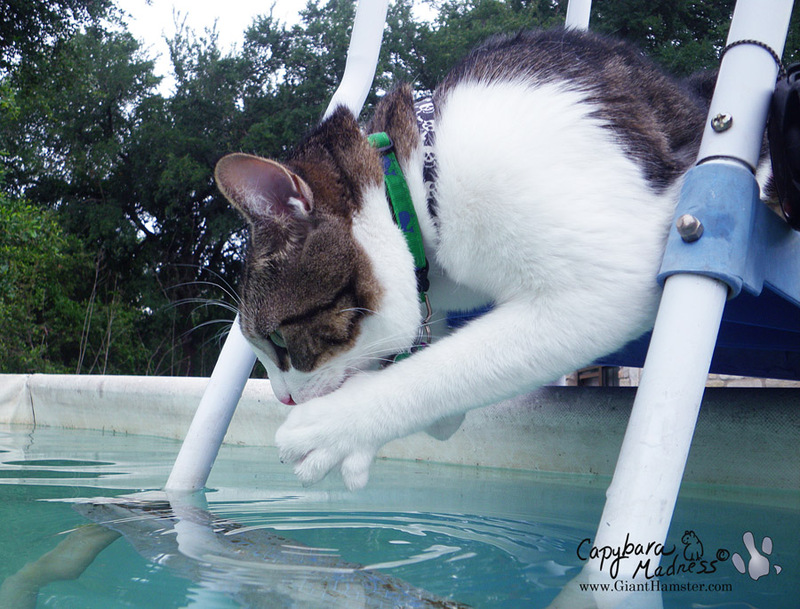 The most he did was dip his tail in the water. Still, it’s a start. 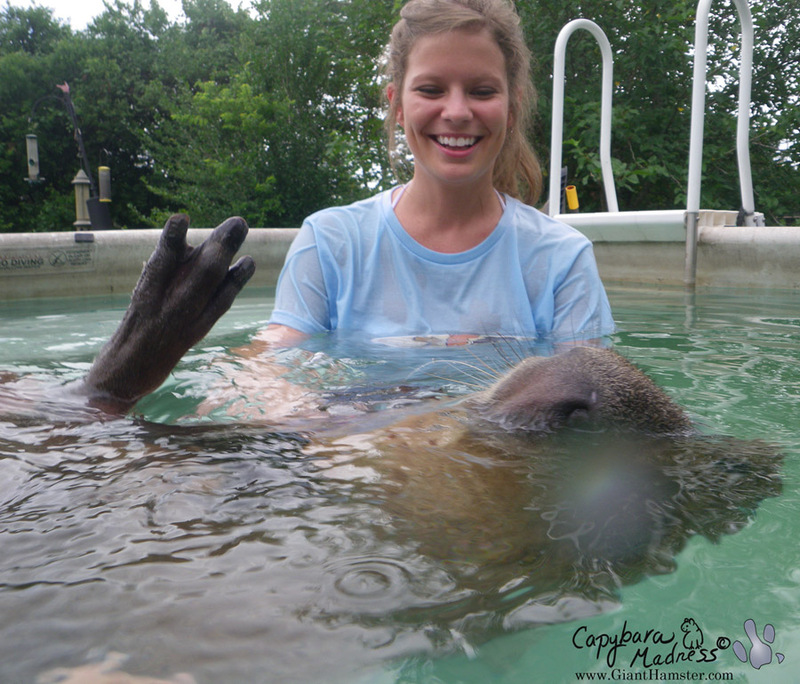 If he does a little more every time he comes over, soon he’ll be swimming with me. 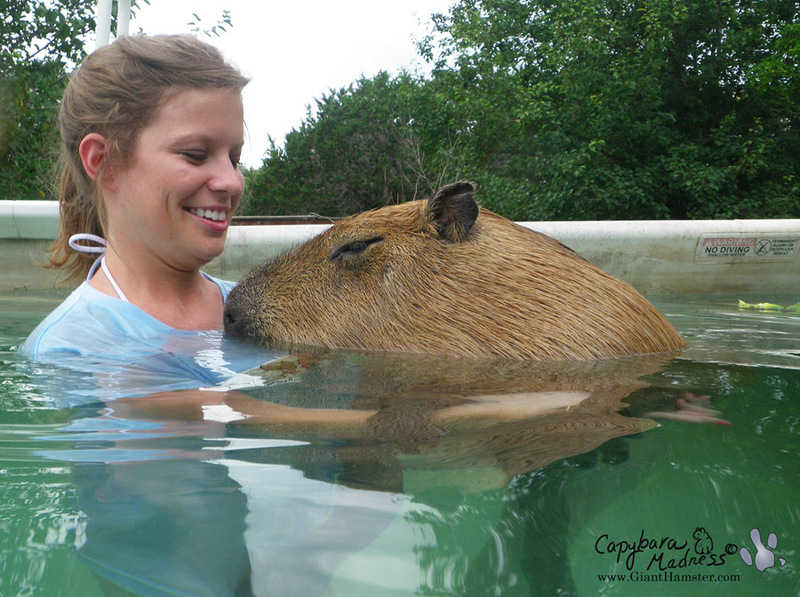 You’d think entertaining stalkers for an afternoon would be all that my position as Capybara Ambassador would require for a weekend, but you’d be wrong. 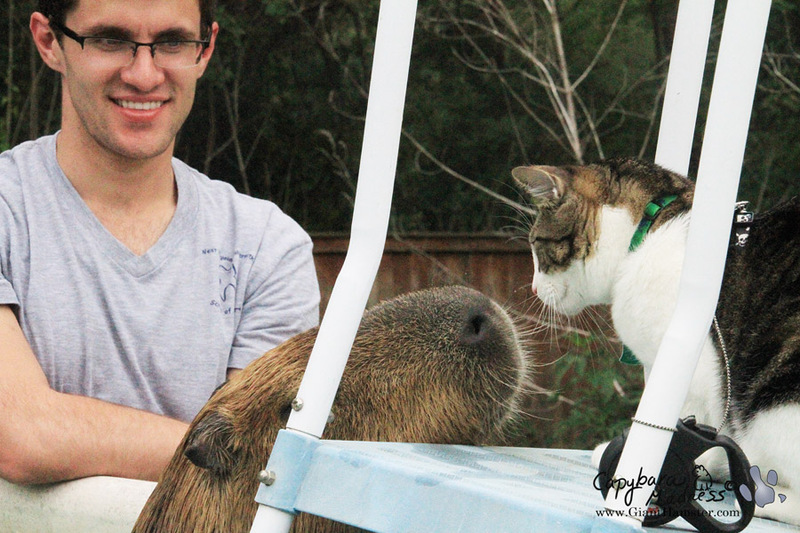 Today (Sunday), I went to the Universal Unitarian Church in Austin to teach people all about capybaras. My Rick went with me, and Coral joined us there. Of course, Melly did all the talking. If there’s one thing I say about Melly, it’s that she is a talker. Melly starts talking and doesn't stop for an HOUR! 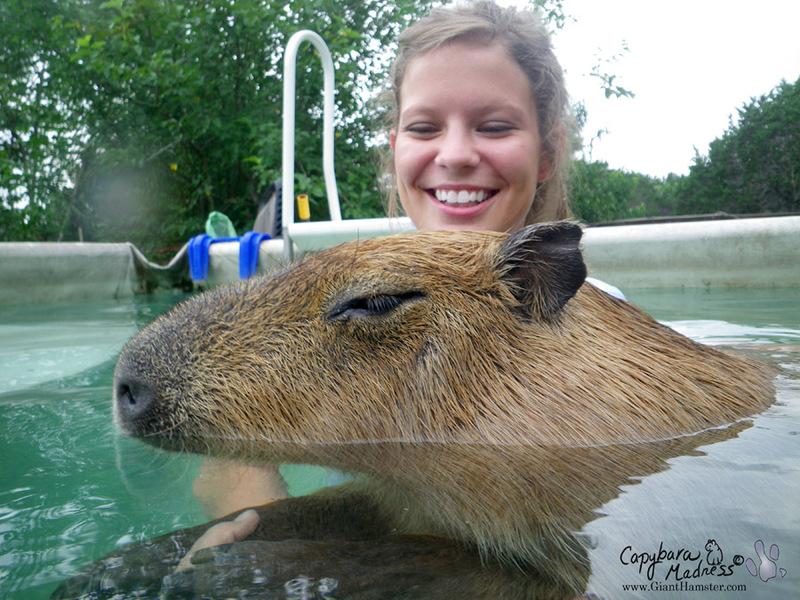 The church is quite small and they said many of the members were out on vacation, but the people who were there were really enthusiastic about learning about capybaras. 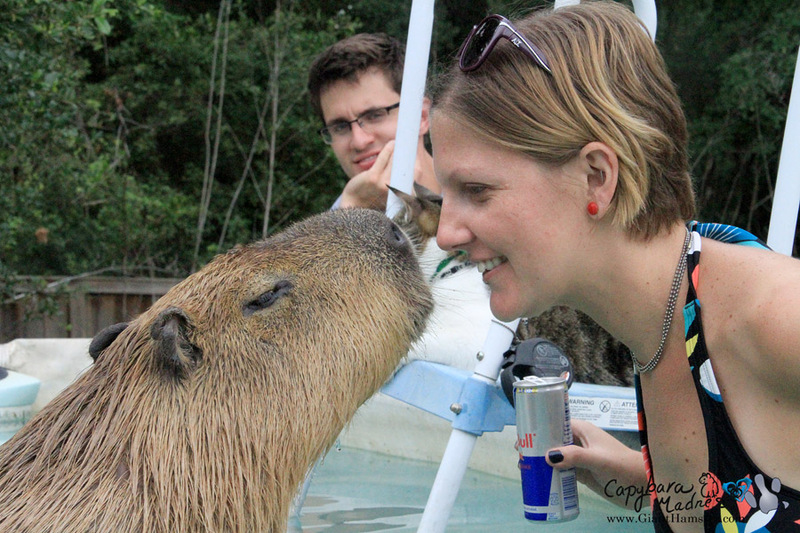 Melly’s talk was on Capybaras in the Wild, so it wasn’t all about me like it usually is. 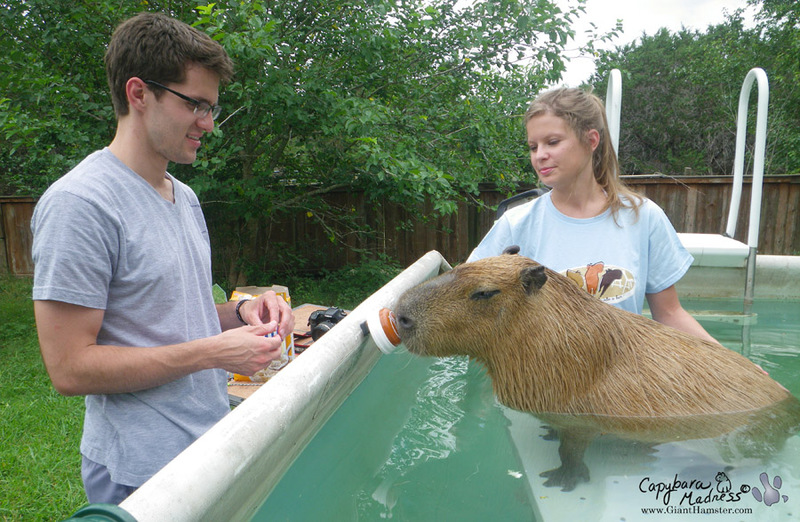 I was just there to serve as an example capybara. 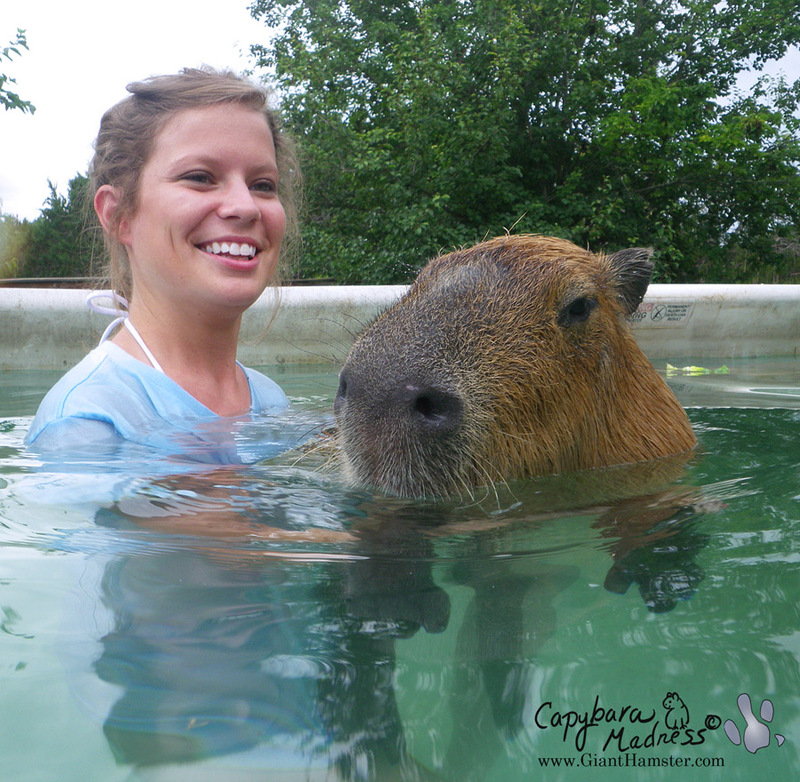 I think everyone probably thought we capys are a bunch of cowards. I couldn’t help being afraid! This was my first trip after my last vet visit and I kept expecting to be harpooned at any moment. 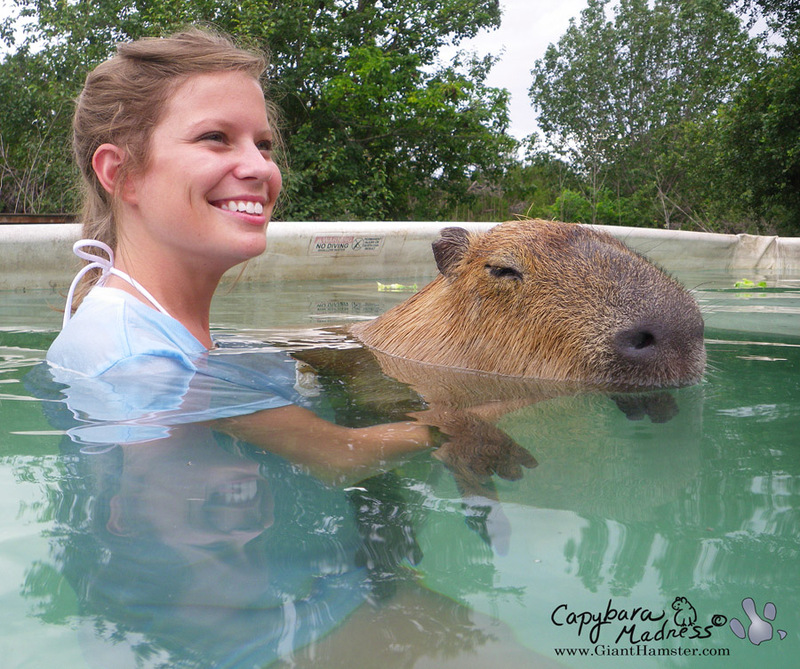 The group invited us out to lunch at a capybara-friendly restaurant but Melly and Rick both agreed that I was too nervous to stay out any longer. 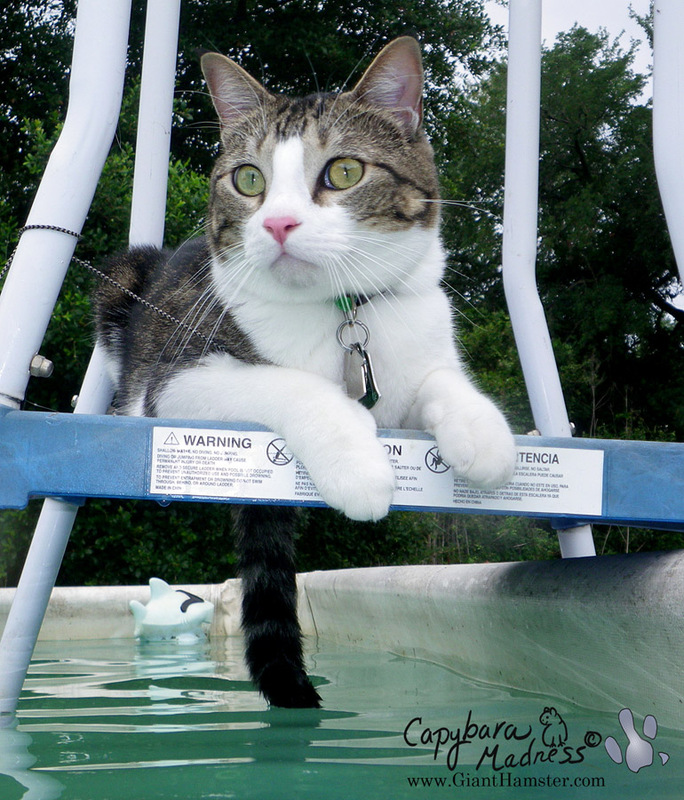 When I got home I went straight to my green pool to get unleashed and then I took a long nap. One last thing! I’m just going to tag a rabbit update in here. Oakley and Dustabelle sitting in a tree, k i s s i n g! It looks like Oakley and Dustabelle are really hitting it off! They look pretty adorable together. 11 comments to What a Weekend! Aw, so glad you had fun with your stalker and at the church. Probably not going to get Flopsy to swim with you, but it’s good to have a life guard to sound any alarms that might need to be sounded :)Glad the bun ones have settled in together, and like each other. 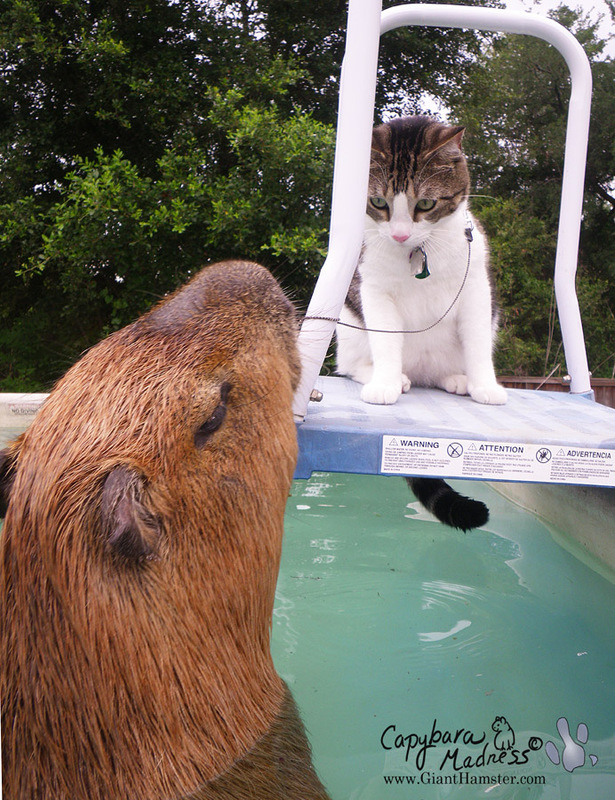 You are such a busy capy, i am envious of your stalkers!. O happy stalker! Mebbe one day I’ll be a stalke and we’ll meet. 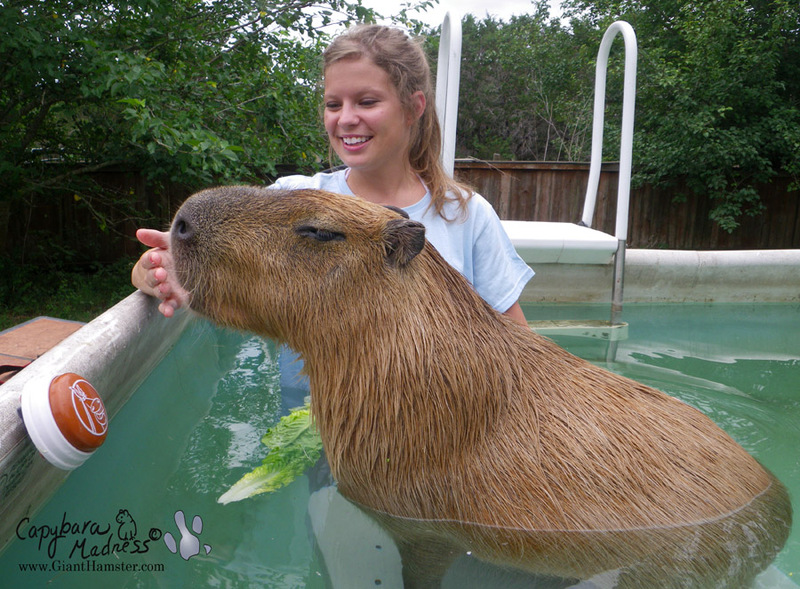 You are such an admirable capy! Yet you say there are others like you? How lucky is the world! Hopefully some day Imcan come down and stalk you. Would love to!!!! Sounds like things went well at church. The world is a better place with you here. I truly enjoy following you – not stalking yet – and your blogs. Happy week!!! You seem to get along well with female homosapiens…. That’s a phenomenon. And the car with a safety wire, quite impressive. Just wonder, if we visit you without any treats, how would you react, mate. Have a nice day. 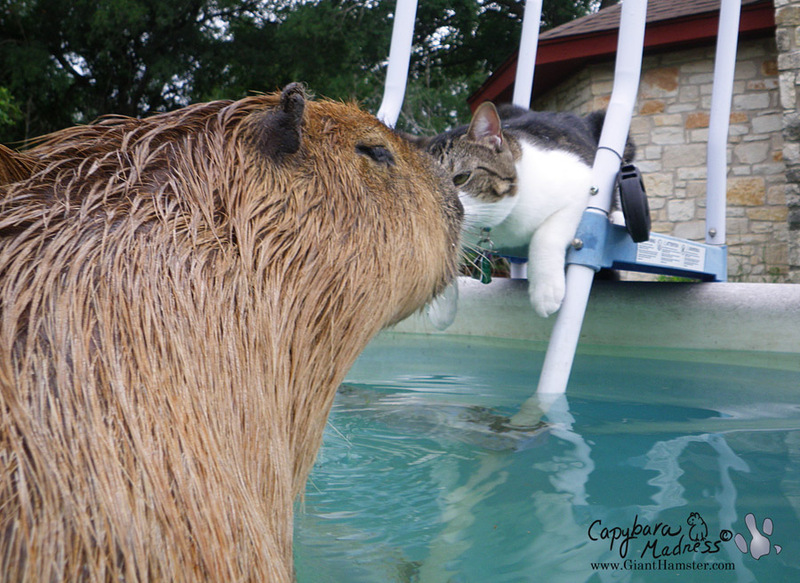 I had a couple visitors this weekend, but nobody ever wants to go into my pool with me! I think they’re afraid of the goldfish! Gorgeous photos of you and your stalkers! I wish my UUA church wasn’t so far away (Peterborough, New Hampshire) — we would LOVE to have you come visit. In fact, yesterday our service was our annual “Blessing of the animals” and all critters and people were invited. I think it should actually have been called “Blessing of the Black dogs and one or two spotted dogs” but people brought photos of their animal companions who could not attend. It was outdoors and the weather was very nice. SO much fun!!!!!! 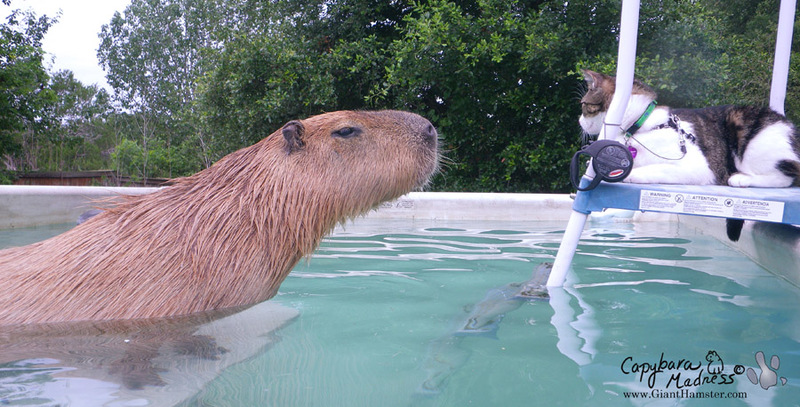 awesome capybara 🙂 thanks so much!! !